Ever wonder what it is like to get a sponsorship package from KendamaUSA? Well Jake goes all out in this video and shows off all of the kendama’s that were sent his way! Enjoy! Want to get your hands on one of the kendama’s in the video? click HERE!! Our most anticipated Kendama has arrived. The 2012 Pro Models are now available!!! 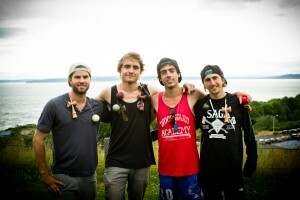 The Kendama USA Pro Team is made up of a distinguished, talented, and positive group of Kendama players. These seasoned veterans have been true innovators, pioneers, and inspirations to the growing number of Kendama players around the world. Each team member has chosen his own unique engraving and tama color for this very special product release. The 2012 Pro Models use a dense, high quality dark cherry wood for the Tama. 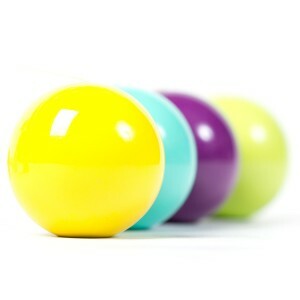 This extra weight gives your Kendama a unique feel, sound, and control while playing. Each Pro Team member has his signature laser engraved into the handle. Inside our brand new packaging, you’ll find an envelope stuffed with a handful of fresh stickers, and instruction guide, and and extra string and bead. A portion of every purchase goes directly to that player. Help support your favorite Pro!!! The Pro Models have been our fastest selling Kendamas to date. Act fast to be sure and get your piece of history! 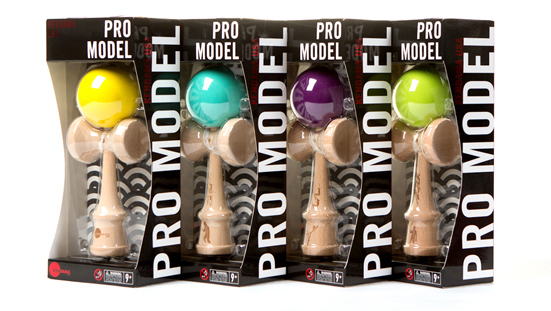 If your local store does not carry Kendama USA products, let them know you want them before they’re gone. You can also order the Pro Models online in our web store HERE. When will the Pro models be out? NOW!!! Check them out in the store. What color is Alex Smith’s Pro Model? This is Alex’s first Pro Model from Kendama USA. He has chose Sage Green as his color. Great pick! Why did the rest of the team choose the same colors as last year? We wanted to improve on the Pro Models we produced last year. There have been huge improvements to our manufacturing process, materials, and overall product design. We wanted to re-release the original colors along with Alex’s pro model for our supporters to have a higher quality version of our classic Pro Model. Will you ever pick new colors for the Pro Models? Yes. The next version of Pro Models (2013) will have all new colors. What else is different about this Pro Model series? We have been tweaking the dimensions of our Ken on each production. Compared to the most recent batch of Tributes (spring/summer 2012), the Pro Model kens have slimmed down just a bit where you grip the ken, and have also thinned down the spike for a precision spiking experience. The Tributes have always been noted for their excellent balance and weight distribution, and the Pro Models are our newest tweak to an already superior Ken. Will you keep making this version of Pro Models? We don’t plan to. After this production is gone, we plan to move forward with some of our new ideas for 2013.
Who is the next Pro? We’ll find out in 2013!! !